Last night I came home from work and the last thing I felt like doing was putting any effort into cooking. I knew we had some burgers in the freezer, so I pulled them out to thaw and decided tater tots for a side. Once Brent threw them on the grill, I decided that I was just going to eat mine with cheese, mustard, and ketchup. No fancy pants toppings this time! Just a damn good and simple burger. Until, I decided that bacon didn’t sound too bad…and if I was cooking bacon I could certainly take 5 minutes to sauté some crimini mushrooms because I need to use them up… and oh no, we only have one slice left of the good cheese, so why don’t I use up the goat cheese in there from that failed dish I attempted the other night… oooh I have a lonely little sun-dried tomato…I’ll make a goat cheese sun-dried tomato spread for it! That jar has been taking up way too much space in the fridge anyway. And right there folks, is how I almost always get carried away with dinner. Sometimes I think there should a twelve step program of some sort for this type of behavior. But then…what would I share with you? These little beauties were delicious and completely satisfied my burger craving. The burger was juicy, the bacon crispy, and the goat cheese sun-dried tomato spread was awesome. It was the perfect compliment to the burger and other toppings. I devoured these with no shame, juice dripping down my chin, and inevitably onto my shirt, which now is probably ruined. Not that this is anything new to me, I tend to always get something on me from either the cooking or eating part of the process. With Memorial Day coming up, the spread would be a great and simple addition to your cook out. It seriously takes less than 2 minutes to whip together, and that includes pulling out the ingredients! 1. In a sauté pan over medium heat add your butter/oil and mushrooms. Sauté for approx 5-7 minutes or until mushrooms are lightly browned. 3. Heat your grill to high and place burgers on when ready. Cook to desired temperature. About 10-12 minutes for medium, it will depend on your grill’s temperature. If you want your buns heated or toasted, add it at this time as well. 4. 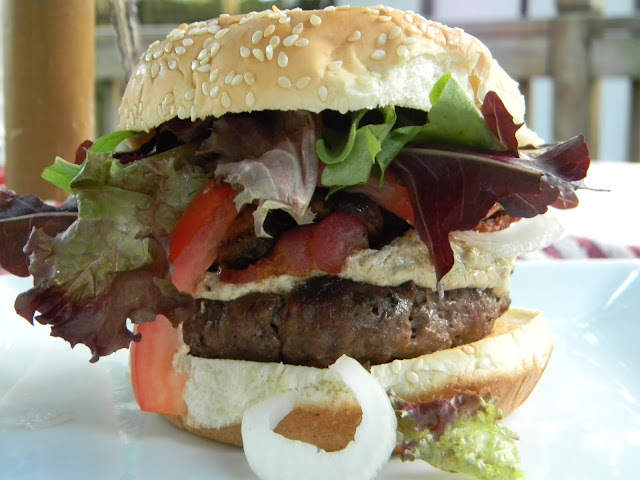 While burgers are cooking combine goat cheese, milk, and sun-dried tomatoes into a blender or food processor. Pulse until sun-dried tomatoes and goat cheese are fully combined. There might still be a few small chunks of tomatoes, which is fine. Taste and season with salt and pepper as desired. 5. 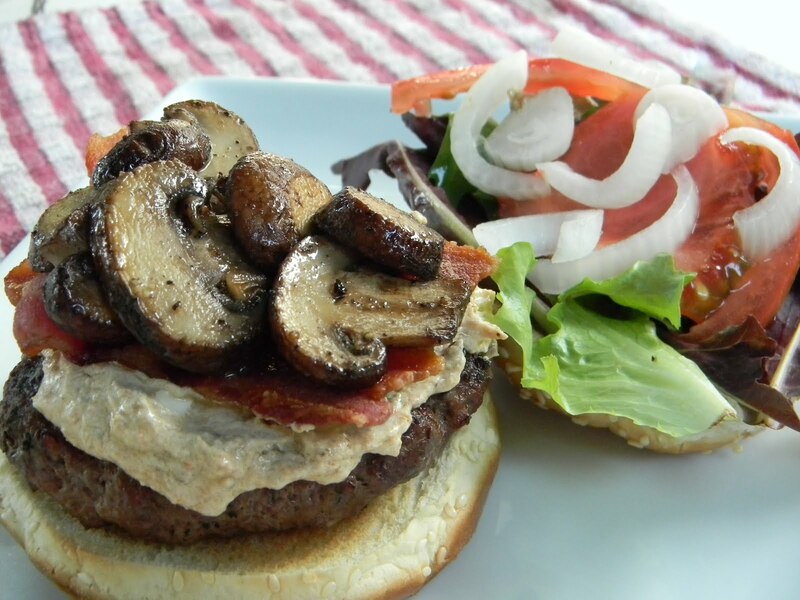 Assemble burgers by smearing equal amounts of sun-dried tomato goat cheese spread and top with bacon and mushrooms. Um, yeah...YUM! That looks soo yummy, along with pretty much everything else! Omg...looks and sounds so good! Those photos just keep getting better & better! I grew up in a burger house. We had grilled burgers on average twice a week. It used to get old, but not I crave a good cheeseburger and will go out of my way to find one. These look divine!